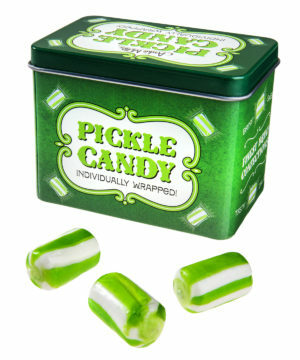 Pickle Candy: Sweet pickle-flavored hard candy. Satisfy your craving for sour and sweet when you pop a Pickle Candy in your dill hole. The white and green lozenge harkens back to classic old-timey candy while the pickle taste in the form of a sweet lozenge gives a whole new perspective of what hard candy can be. With a dill-forward bouquet and a sweet finish, this pickle candy is one you'll want to pick a peck of. Sorry! We're sold out until June 28. More stock arriving on June 28, 2019.